He didn't want to do it. There was some arm twisting involved. I forced my husband to sit and watch a movie about love, marriage and romance....and cooking. "C'mon, you haven't watched a romantic comedy/dramedy since we were dating," I reminded him in my you-owe-me-why-don't-you-love-me tone of voice. "It's good, I promise you'll like it." Okay, I couldn't promise. I hoped he would like it, but I couldn't promise. 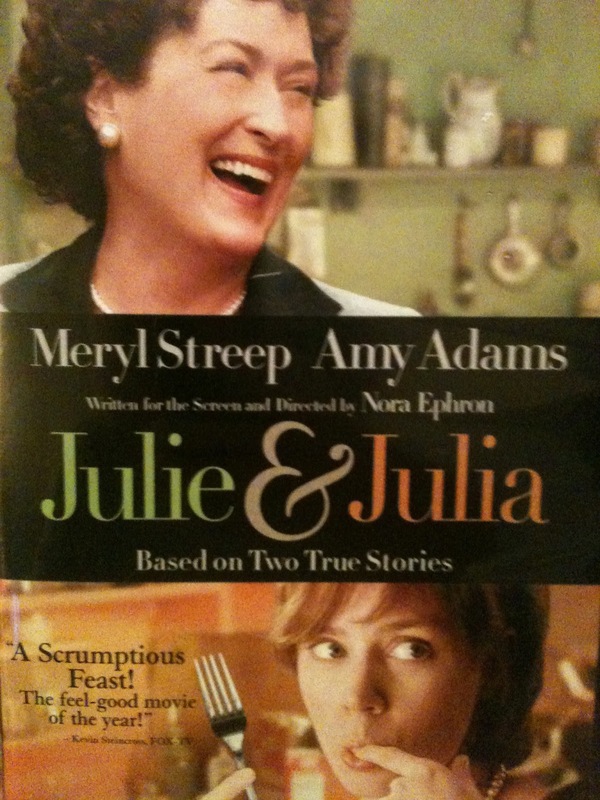 So last night, we sat down to watch Julie and Julia. I got the movie from Mommy Bear Media--a great place for family friendly movies and mom and dad friendly movies. (I was invited to write reviews for movies for Mommy Bear Media, which is pretty awesome.) What started out as a writing assignment turned into a reluctant date night. As I put the DVD into our ancient DVD player I could tell Tim was hoping this would be the night the player would finally die. But amazingly it worked, albeit with a strange creaking sound as I hit play, but it worked. The movie is about two women searching for fulfillment with the full support of their good-natured husbands. It's about passion--in life and in love. "You are the butter to my bread, the breath to my life." Some people might watch this movie with a cynical view and say that men like this, husbands like this don't exist. But they are wrong. These husband characters are my husband. He is that supportive, stable, mostly unwavering type of guy. He is my rock, my biggest fan. He talks me down in tense situations. He talks me up when I think there is no way I can do it. The other day I was telling a friend that I literally had to step away from other relationships and toxic situations to focus on my marriage. My husband, my rock, the butter to my bread, the breath to my life came first. He deserved it. We deserved it. This movie is a love story about married people without all the cliche (and still very, okay sometimes, funny) jokes about the over-tired, cranky, critical wife and the doofus, bumbling husband. This movie is about educated, loving, caring people supporting each other. The movie is also about never giving up on a dream, being open to discovering new dreams and appreciating good food and flavors. If you don't come away from this movie wanting to cook, start a blog and stay married to your husband than it's on you man. And I don't get you. Another side effect from the movie is that it makes you speak in a Julia Child accent/style on and off for days. Bon appetit! I'm happy to report that while my husband isn't starting a blog or offering to cook dinner, he is agreeing that Julie and Julia is a good movie. And he only fell asleep during the movie twice, woo-hoo, the romance is still alive. Thanks for the excellent review! !